This is a story of love and hope. But first we must dive into the pain. Have you ever tried to take on reality with a truly open heart? How do you handle all the suffering in this world? Do you experience ​restlessness? Maybe you cannot sleep at night because of what you’ve seen on the news. All these power-hungry politicians, wars, nature catastrophes, pollution, stupidities and worse. You ask yourself: What is this world we are living in? Thoughts might creep in that you don't want to live in a world like this. But you DO want to live and you cry, because you don’t know what to do about it. You feel small and unworthy and quickly you close your heart again. You are afraid to become depressed and it just seems too dangerous to truly feel. Rather, you'll continue to numb your feeling with whatever is ​your choice of elusion. Living with an open heart is a challenge in this world. While not doing it is like closing down all access to joy and pleasure in life! What seems like a double edged sword, in reality, is a simple decision you can take for your own healing and personal wellbeing. Yes, the sadness you feel when you ​open your heart hurts. When you start to wonder what you can do to change this world, feelings of hoplesness and desperation are common.​ I understand this frustration just too well. But what I've come to experience, is when the sadness happens in ​your personal life, ​you cannot close your heart anymore. ​You may be able to close your heart to the outside world. But when something bad happens with your family or loved ones, this strategy doesn't work. The feelings are just too strong and they come through - if ​you want them to or not. And you must feel these feelings, painful or not​. Such strong feelings are ​a powerful force threatening to bring ​you down​. When you learn to build up resilience in your heart, even negative events have the power to eventually lift you up and bring you forward on your path of personal grwoth. "Anyone can just look around and see how massively screwed we are as a society thanks to pretty much none of us growing up learning how to live from the heart." ​You can overcome these feelings of hopelessness, disillusionment, and pain with a simple effective technique called the Breath of Love. When you want to increase your resilience how to deal with life's daily stresses - this simple, heart-centered meditation helps. Energetic protection is also very helpful to learn as it will allow you to protect your entire being and especially your ​heart. With a strong energetic protection in place, you will be able to fully engage with what is going on out there, without letting in the negative stuff. It allows you to remain open and centered in your own being, open to fully experience joy and pleasure in all areas of your life. Everybody can learn energetic protection​ with some practice. Working with the Chakras ( = energy centers in your body) and the human energy field is exciting and rewarding. I use advanced shamanic methods to protect and strengthen my energy field on a regular basis. Any kind of Chakra Meditation is a good way to start. I will write more about this, but for now, if you've never even heard of Chakras and are unsure what the human energy field is, I propose a simple exercise: Stand with your bare feet firmly on the ground. Breath deeply. Go with your awareness to your feet and imagine there is an opening on the sole of your feet. Out of this opening grow roots deep down into the center of the earth. Connect yourself with the earth. Breath deeply. Say thank you. 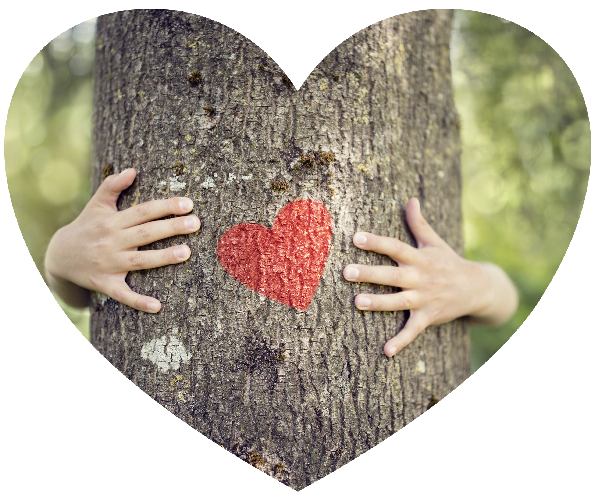 This is a basic grounding exercise to give you a solid foundation for any work with the heart. You might want to do this first and then do the Breath of Love meditation. ​I want to tell you this story now, because it really changed my perception of my entire life. Although I had many years of working with energetic and shamanic ​methods behind me, I was not immune to certain doubts about my life. Until that moment, when my son was just a baby, ​an eye opening revelation came to me. I was alone and tired. That was my permanent condition at that time and nothing to worry about per se. But of course my skin was thin and it didn't need much to send me over the edge. It wasn't just because I was alone with the baby, being with his father would have been so much worse. But it was everything that we'd gone through, that brought me to a depth of feeling that I can only call the dark night of my soul. No, it was not the first one. But now I was not alone anymore. I had a helpless little being to take care of and I was desperate. He just w o u l d n o t s l e e p. Again! He'd sucked me dry and it was early in the morning. I hadn't closed an eye all night, and not much the many nights before. I felt like I couldn't do it anymore. First, I was screaming. Angry at myself, the baby, the world. Then I was crying the floods of Babylon. I couldn't hold him anymore. I needed a break, but there was none in sight. What a bad mother I am, that I don't even have the energy to stay present with my baby, I thought. And it all just felt too hard to continue. But of course I had to, there was no way I was going to give up on him, never! And then it came to me. The peace of mind I required. Like the blessing of a shining Angel. The balm for my desperate heart. The answer, that is the answer to all questions. And this Answer is Love! They call it the Dark Night of the Soul. 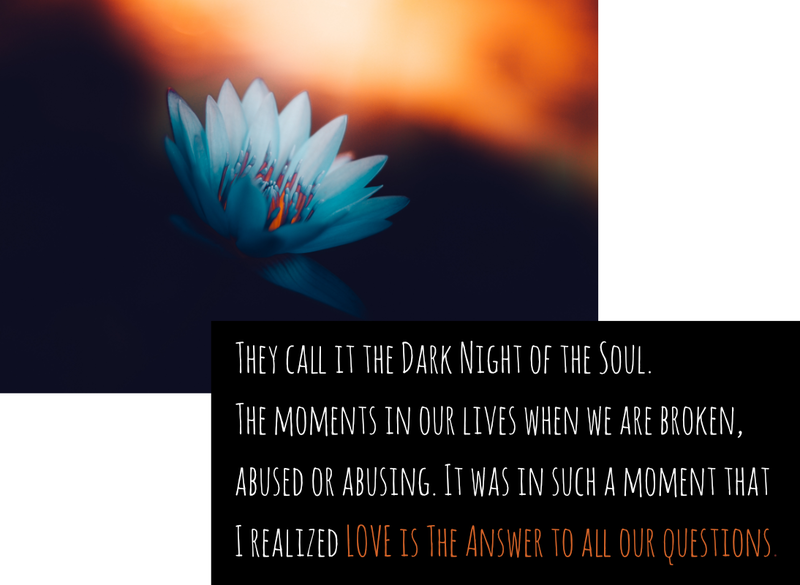 The moments in our lives when we are broken, abused, or abusing. 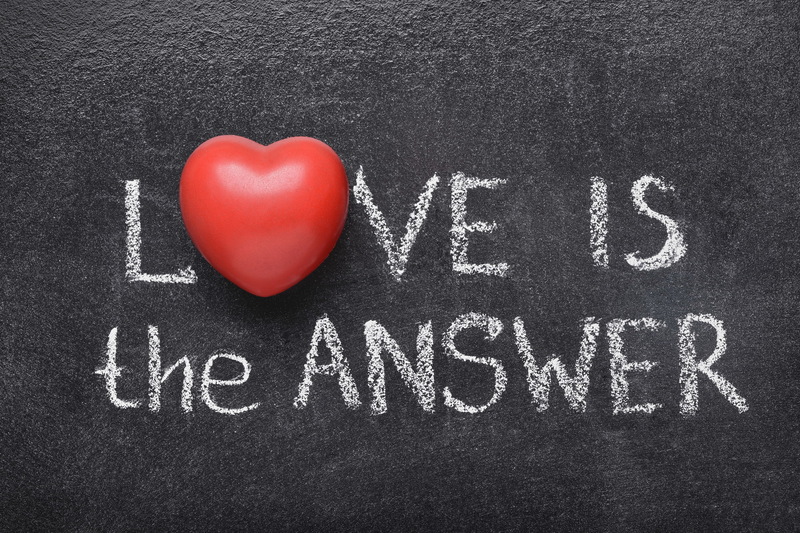 It was in such a moment that I realized LOVE is The Answer to all our questions. Such a revelation might be easy when you hold a beautiful baby in your arms, I realize that. But it changed my life completely. It helped me find forgiveness for the abuse I have experienced at the hands of his father. It helped me, to go through painful criminal proceedings and the subsequent battle for custody. And finally, it helped me to find forgiveness for myself and a completely new perspective on how I see the world and my place in it. Love can heal everything. Love understands. Love has no limits. Love is the experience of oneness with our Creator, God, The Divine & The Universe. With Love we can just lean back and trust in a solution that will certainly reveal itself. Love transcends all asking for the why of things! And it is the love you feel in your own heart that is of foremost importance, the love you can give, not the love you receive. Because what you send out, that comes back to you. And so it starts with ​YOU! We all have been wounded in our Hearts. Your healing, your interpretation of what has been happening, lies in your hands.​ You always have a choice. To remain the victim of circumstances or to take your life into your own hands. There are many ways to heal trauma and relationships​. As an Energy Healer and Shaman's apprentice, my way is through a conscious release of the energies that hold us back in the old suffering. ​Re-writing ​your story in a conscious truth seeking way. Allowing you to open the channels to attract goodness and wellbeing into your life​ and teaching you how to be ready to receive this. A simple way to work on your own trauma, is through forgiveness. You can do meditations and rituals to let go of blame and shame and guilt. Like the one you get when you sign up ​for my Newsletter. And if you've already done so, make sure to take the quiet time necessary, to actually ​DO the meditation and reap its full benefits. The work is all about releasing judgement and heal our inner splits. This awakens the higher self, and is your journey into Radical Self Love. Love without condition, they say. And they are right. Love cannot be forced, or bent to our will. Love just is. And when you allow yourself to truly feel it, this love will be unconditional. Free. As we were born. Without prejudices, without judgment. Without the blame and the shame and the guilt - we so often experience. In a state of unconditional, compassionate love - we heal, we understand, and we can move on again. Because we don’t suffer from our circumstances anymore. Instead, we are connected to all life. Understanding with compassion why all this happens. All these terrible things that we’ve been going through. All these terrible things happening in the world. In a state of love, they become teachers! 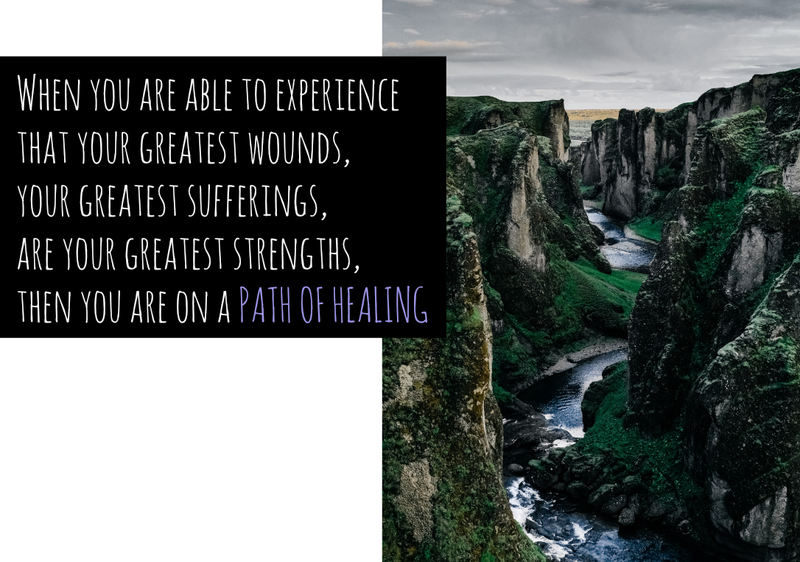 When you are able to experience that your greatest wounds, your greatest sufferings, are your greatest strengths, then you are on a path of healing. ​Love starts in the present. It is the full acceptance of everything that is, and everything you are. Then, love leads you ​to where you are going: ​A future filled with love. Healthy and meaningful relationships. A good world for your descendants​ to live in! I have said much now in just a few words. 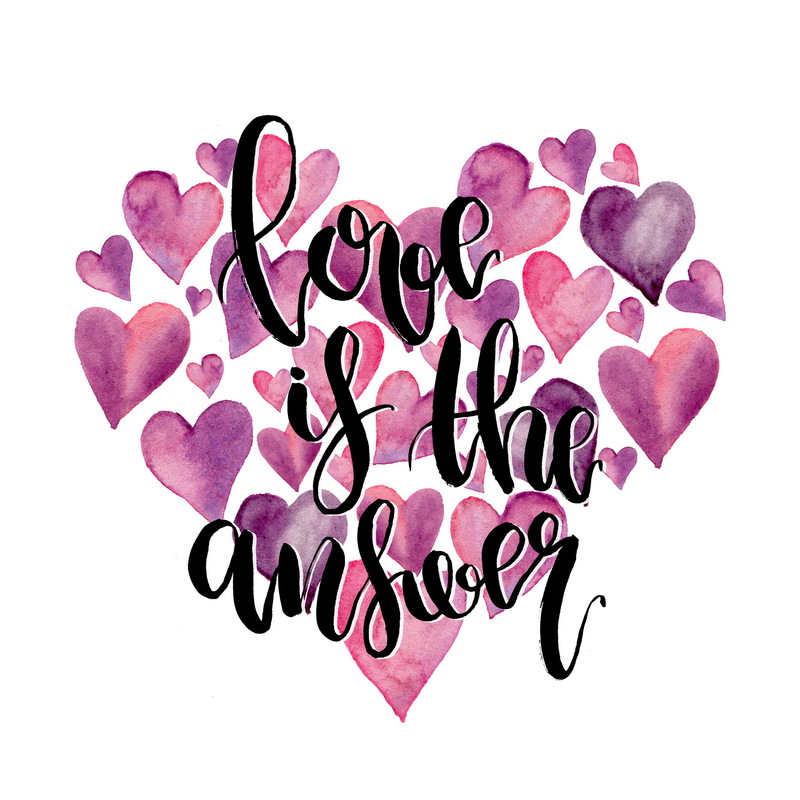 Because all you really need to know is, that Love Is The Answer. Try it out! Are you suffering? Do you wonder why this or that happens and what you shall do against it? Try not to fight it, give yourself into the experience of unconditional love radiating right from your own heart. And whatever desperate questioning and reasoning you put yourself through, try to give it Love as the Answer. I would love to hear your opinions and experiences with this, in the comment section below. I am happy to answer all the questions you might have. ​If you feel called to go deeper into this work, make sure to check out my Work With Me page​. PS - Follow this introduction series and read my next Article "Change Your Life Now", where you will learn about the biggest obstacle to personal change. To receive this free offer, you give Healing Jaguar the permission to send you emails with free content, promotions and special offers. Your data is safe with, and you can unsubscribe at any time. Thank you, this information really helped me to realize I have to work on keeping my heart open. Keep the good work up Tam! ​I agree to give Healing Jaguar permission to send me emails with free content, promotions and special offers. My data will not be shared or sold, and I can unsubscribe at any time. 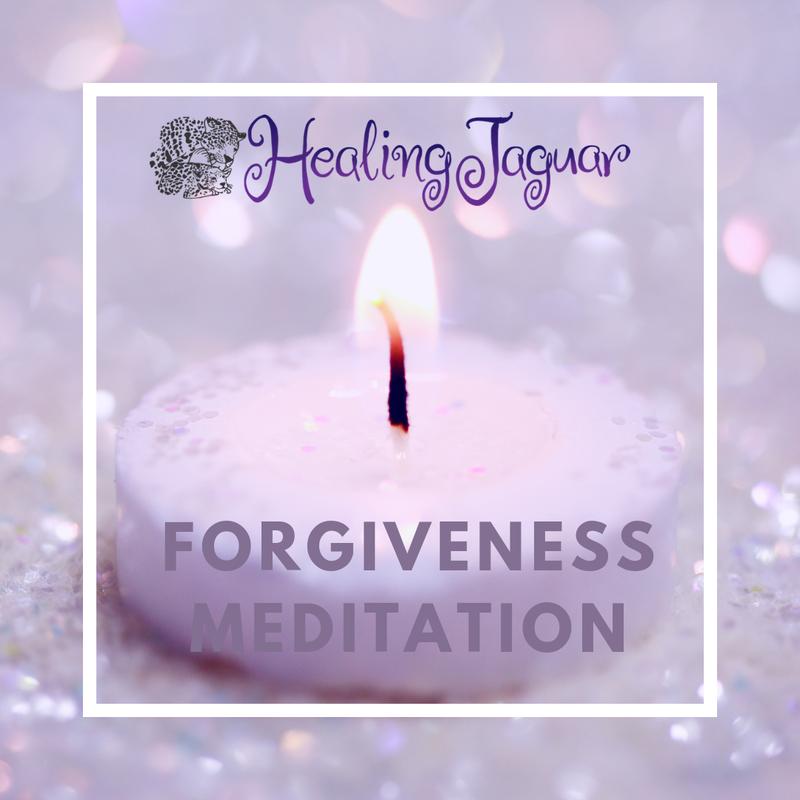 ​To receive this free offer, you give Healing Jaguar the permission to send you emails with free content, promotions and special offers. Your data is safe with, and you can unsubscribe at any time.